Disclosure: This post is sponsored on behalf of #appleweek. Our generous sponsors, Swiss Diamond, Envy Apples, Imperial Sugar, Nordic Ware, Rodelle Vanilla, Flahavan's Irish Oatmeal, Nairn's and The Spice House have provided us with products for recipe creation and a giveaway for our readers. As always, all opinions are my own. 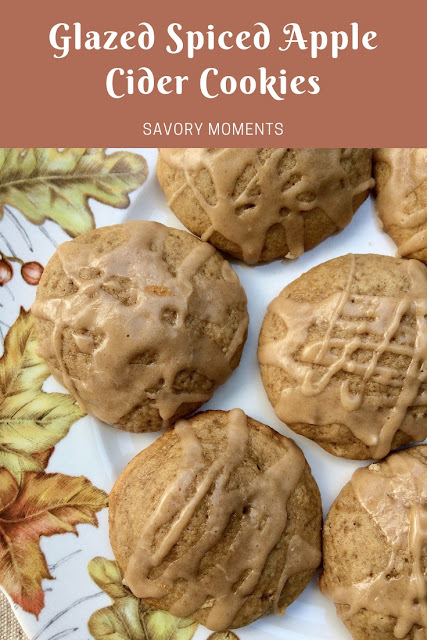 Soft, fluffy cookies are flavored with reduced apple cider and spices and topped with a cinnamon and apple cider glaze for a festive fall treat! This is the second of my #AppleWeek recipes that I'm sharing this week. These apple cider cookies have been a work in progress for a few years now. I never feel like they turn out quite right or have enough apple cider flavor in them. For this recipe I've reduced the apple cider to help concentrate the flavor and also added a glaze made with that as well. That and the addition of some mulling spices create a delicious autumn cookie. I know I've mentioned many times in the past that I make cookies each year to take on our family annual apple picking in October. Apple picking is a tradition here and one of my favorite days of the year. 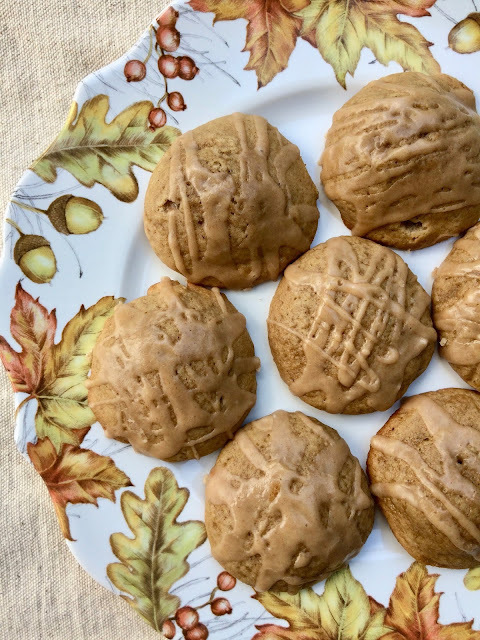 These cookies would be perfect to take along on a fall outing or enjoy at home after a day of picking apples or pumpkins, or just playing in the leaves. 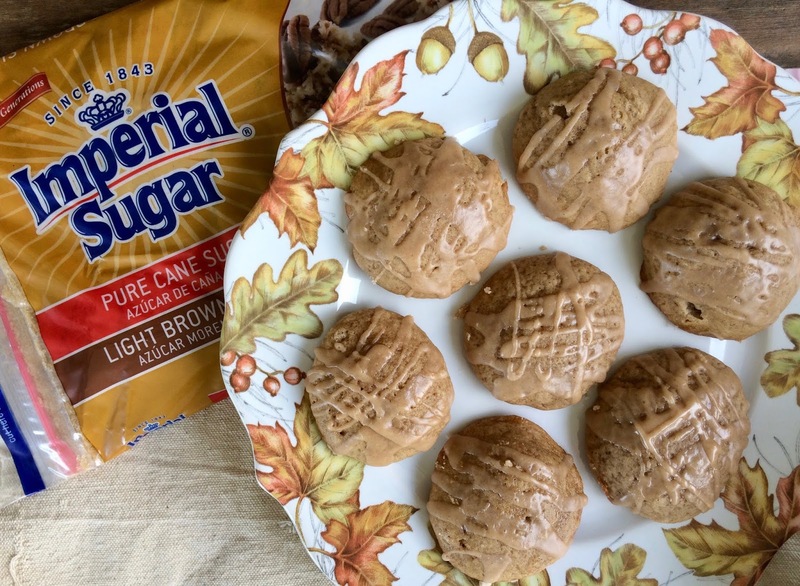 I used Imperial Sugar's granulated, light brown, and powdered sugar in this recipe. This recipe makes about 2-1/2 dozen cookies. Preheat the oven to 375 degrees. Line two baking sheets with parchment paper or silicon baking mats. In a stand mixer with a paddle attachment (or a large bowl with a hand mixer), cream together the butter, brown, and granulated sugars until light and fluffy. Mix in the apple cider, buttermilk, and egg. In a large bowl, whisk together the flour through allspice. Slowly mix the dry ingredients into the wet until combined. Use a small cookie scoop or a tablespoon and place the dough on the baking sheets, about 2 inches apart. Bake for 9-11 minutes, until they are lightly golden. Let cool on the baking sheets for a minute and then remove to a wire rack to cool. To make the glaze, whisk together the powdered sugar and cinnamon in a small bowl and slowly whisk in the apple cider until the glaze can be drizzled. Drizzle onto fully cooled cookies and let dry completely. Store in an airtight container. The cookies are very moist and will not last more than a couple of days. *Start with 1-3/4 cups apple cider in a small pot. Heat over medium heat, stirring occasionally, until it comes to a boil. Reduce and simmer, stirring occasionally, until the apple cider has reduced to about 1/2 cup of liquid. Let cool. check out all of today's recipes! These are some perfect Fall cookies. Love the idea of using apple cider to make the icing. I love soft and fluffy cookies and yours look really delicious! The cookies look great but I am LOVING that platter. Thanks, Wendy! Me, too. My mother-in-law found it at a garage sale! I've been buying some fabulous locals apples. Thanks so much for your apple recipes. Love the cookies and the apple butter. These cookies looks delicious. Thank you so much for the recipe. the glaze is what takes these above and beyond, amy--yum!! I love a cookie made with brown sugar...so much flavor!!! I love apples and brown sugar together and these look absolutely fabulous! These cookies are the epitome of Fall! YUM :) Pinned! !